Day Two of the Share the Love Theme Sneak Peek!! Here is a really cute little card I've made, I hope you enjoy it!! I've used the new Bloomin' Hearts stamp set for both the hearts & sentiment, & the Love Blossoms Designer Series Paper. How cute are they? 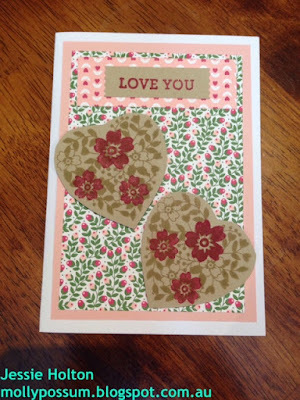 The hearts & sentiment are on Crumb Cake card stock, the outer border is Blushing Bride & the base is Whisper White. I have fussy cut the hearts & used the Washi Label Punch for the sentiment. I have used Rose Red & Crumb Cake inks. And of course, I have propped it all up on Dimensionals. 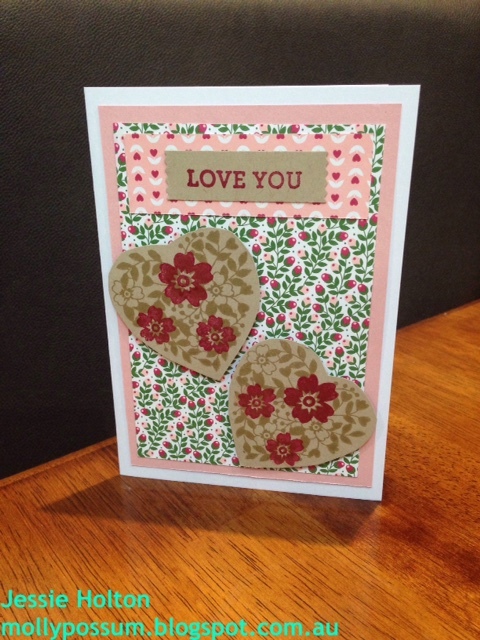 Bloomin' Hearts stamp set and the Love Blossoms Designer Series Paper come out in the new catalogue on 5 January. The other products I have used are below. Remember to use my December Hostess Code 3JKG26HJ when ordering so you get extra goodies from me! Remember to sign up for my newsletter so you get all my news & specials! Crazy Crafters & Pootlers December Blog Hop! Christmas Cards for my eBay Shop! Chrissy Cards for my Neighbours!